This 3 day Santorini itinerary is perfect for first timer's to the beautiful Greek dream destination. 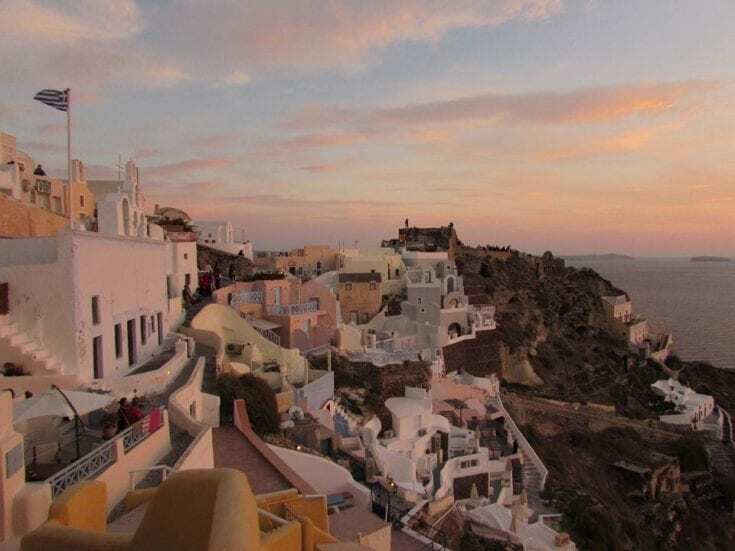 Spend 3 days in Santorini, enjoying sunsets, epic views, and more! Most first-time visitors to Greece choose to include a trip to Santorini in their itinerary . Renowned for its whitewashed houses, blue domed churches, serene views and stunning sunsets, it's a dream destination come true. As you can imagine, Santorini is very popular, especially in summer, and there are lots of options on what to see and do. 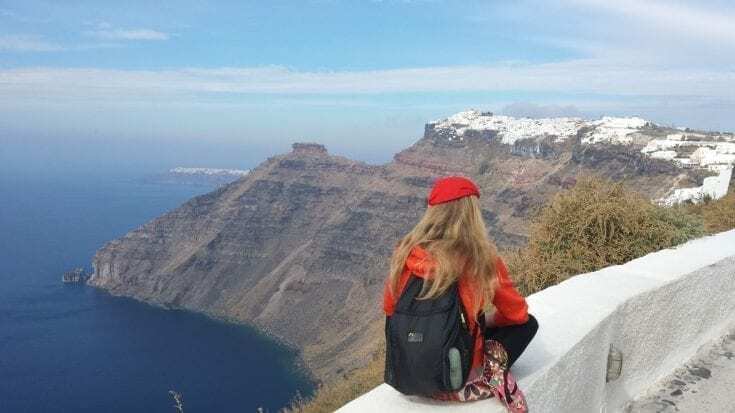 If you are an independent traveler, you will find that Santorini is quite easy to go around on your own, either on buses / taxis or in a rented car. At the same time, Santorini is ideal for people who prefer organized tours, as there are plenty to choose from. Frankly, it can make your life easier as well. Besides, who doesn't want to enjoy a wine-tasting tour, or take a sunset boat trip! I get asked this question a lot, and there is no one definitive answer. Many people have Santorini as a bucket list destination, so want to spend their entire vacation there. Others visit Santorini for a honeymoon, or as a short break. What I would say, is that you probably don't need as much time in Santorini as you think. Once you've seen the main things to do in Santorini, head out to one of the quieter and more authentic Greek islands! Is 3 days in Santorini enough? Personally, I think that three days in Santorini is the ideal amount of time for first time visitors. This allows for enough time to see the main things to do in Santorini, Greece, and leaves a little extra should you want to return one day. So how best to see Santorini in 3 days? Here is a relaxed 3 day itinerary for Santorini, Greece, to help you with your planning. It's designed to cover the best places to see in Santorini, whilst providing options for enjoyable half and full day tours. There's also a list of the best beaches in Santorini, along with some suggestions for the best places to eat in Santorini. 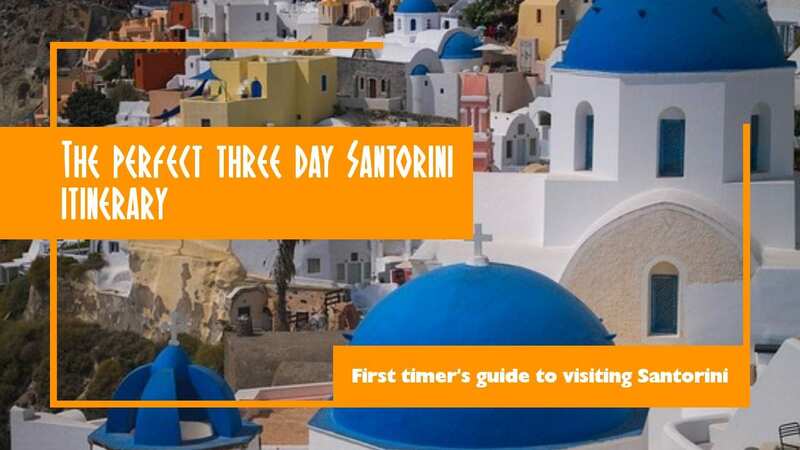 Whether you follow this Santorini 3 day itinerary exactly, or use it as a base to create your own sightseeing itinerary, I'm sure you'll love your time on the island! On your first day in Santorini, the best way to find your way around the island would be to take a tour that combines wine-tasting with some sightseeing. This way, you can see Santorini’s highlights with a guide, and then go back in your own time if you want. 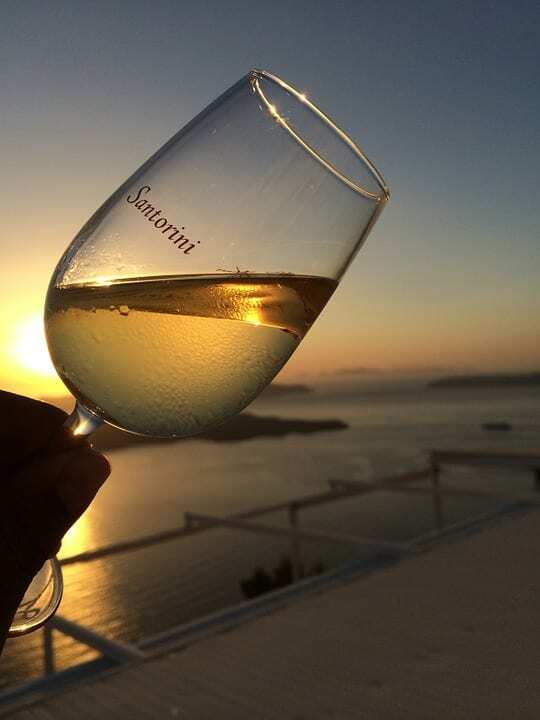 Most importantly though, you will get to experience a few different Santorini wines, and get an idea of what to order at Santorini restaurants. And obviously, as you are in Greece, you must take some time to relax on the beach! There are several wine-tasting tours of Santorini. As an example, this one offers some sightseeing on the road to the wineries – Santorini sightseeing with wine tasting. The tour will either return you to your hotel, or drop you off at Perivolos beach, one of the most popular beaches in Santorini. If you prefer to be independent, you can organize your own Santorini wine-tasting and sightseeing tour by renting a car and driving around the island – the problem here is that there needs to be a designated driver! Some of the most famous Santorini wineries are Venetsanos, Gavalas, Koutsoyannopoulos and Art Space winery, or you can visit the Union of Santorini Cooperatives. Either way, you will get to taste wines made out of several local grapes, such as Vinsanto, Assyrtiko and Nykteri – and perhaps buy a few bottles to have at your hotel or bring back home. A word of warning though – as the sunset in Oia is very popular, the area gets very busy. The famous Oia castle will be really crowded, particularly in high season. If you prefer something quieter, there are several other places to enjoy the sunset in Santorini. In Oia, you can head to the church of Saint John of the Sea (Agios Ioannis Thalassinos), near the lighthouse. Alternatively, you can or drive out to Finikia or Baxedes. 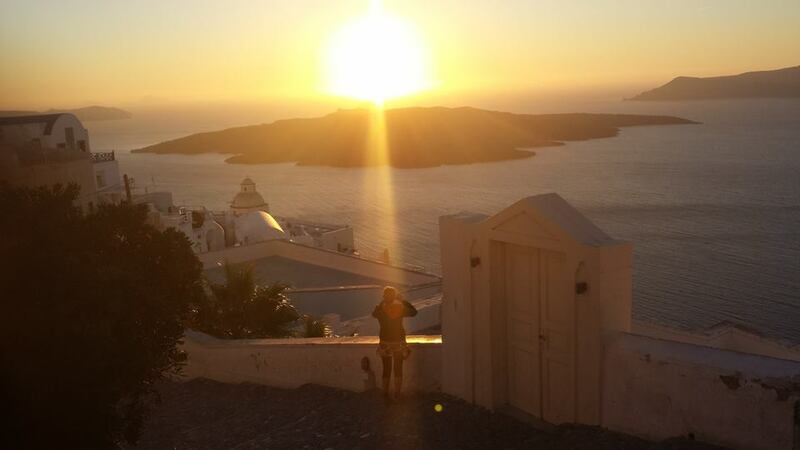 However, anywhere on the west side of the island is great to see a great Santorini sunset. After a long day out, return to your hotel for some well-deserved rest, and head out for dinner. Whatever your budget, Santorini will not disappoint you – you will find street food for a few euros, but you can also indulge in fine dining if you prefer. For more information, check out the section about food in Santorini below. If you decide to just do one organized activity while in Santorini, go on a sailing trip. The unique Santorini landscapes and the dark, volcanic sand, combined with the blue sky, offer an experience that you are likely to remember for years. There are several types of boat tours you can take as a Santorini day trip, depending on the time of year. In high season there are many more choices, and as many sailing trips tend to sell out, it makes sense to book in advance. 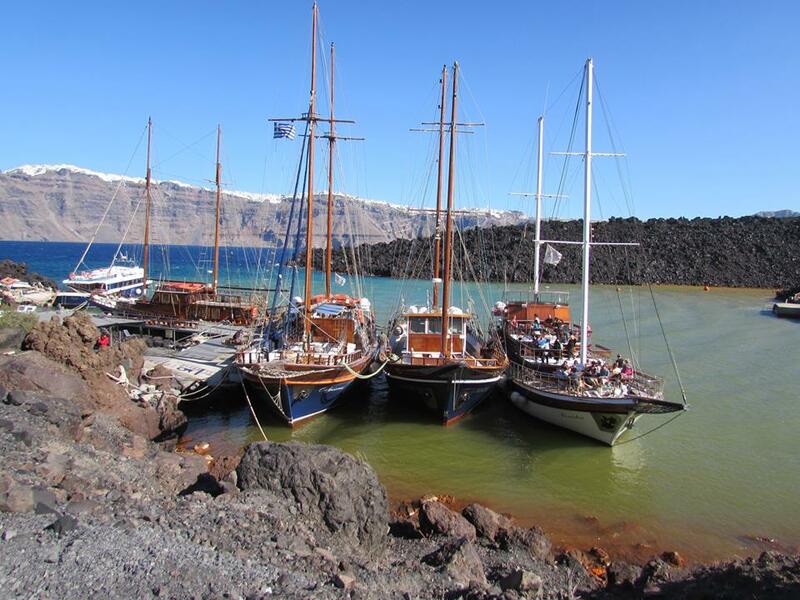 During low season there are fewer different options, and you can even book after you arrive in Santorini, though if you want to avoid wasting time it is also best to book your sailing trip in Santorini before you arrive. Note that not all cruises include stops on the volcanic islands, so read the information provided carefully. 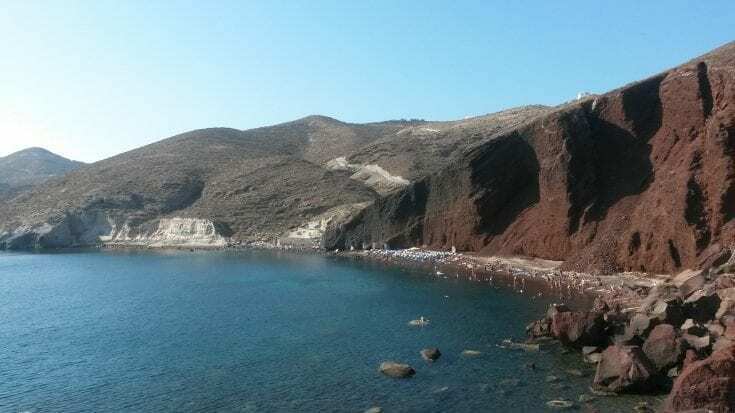 Bear in mind that walking around the volcanic islands can get unpleasantly hot in summer, so if you go on a cruise that includes the Santorini volcano make sure you have plenty of water, a hat, and sunscreen. Most of the cruises also stop off at hot springs, which are especially pleasant if you go off-season. Morning or sunset Catamaran sailing cruise, with stops at Red Beach, White Beach and the hot springs, and meal. No matter which cruise you choose, you will definitely enjoy it. When I visited Santorini off-season, I went on the half day morning cruise that included the volcano – it was really amazing! If you go for a morning cruise, you can spend your evening in Fira. It’s a nice little town, from where you can also see the sunset. Choose one of the numerous cafes overlooking the volcano caldera, and enjoy the view! Have a nice dinner, and finish your evening with a few drinks at one of Santorini’s many bars. If you go on an evening cruise, you can spend some time wandering around Fira in the morning. There are many shops in the town, as well as a couple of museums which very few people seem to visit. It’s worth walking down to the old port, and perhaps taking the cable car back to Fira. There is also the option to return on the back of a donkey or a mule, but please avoid it, as many of those animals are really overworked. 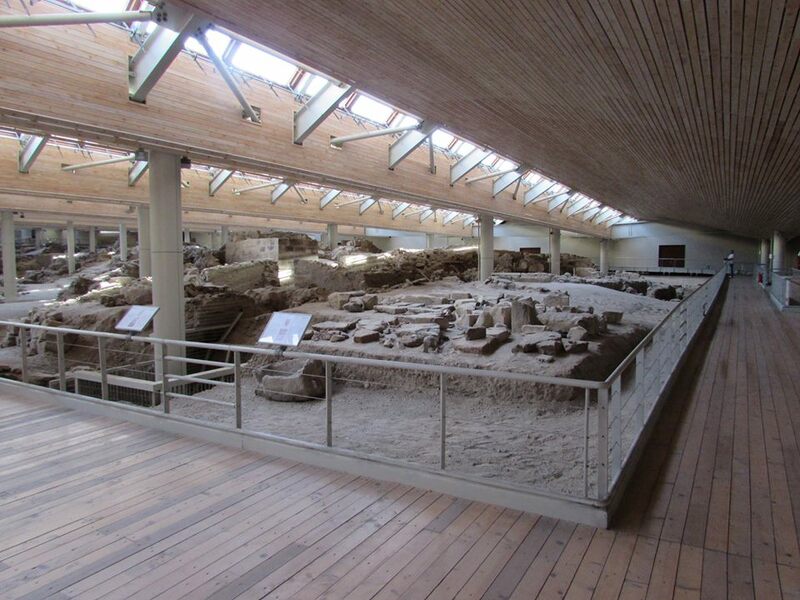 On your last day in Santorini, make sure you visit the archaeological site of Ancient Akrotiri. It’s a settlement of the Minoan Bronze Age that was destroyed around 1600 BC due to the eruption of the volcano, and covered in volcanic ash. If you want to find out more about the ancient civilizations and the volcano’s eruption, you can get a guided tour to Akrotiri. After your visit to Akrotiri, head to Vlichada beach for a swim. The Red beach and White beach are also nearby, but they are not really that great for a swim. You can spend a few hours here, and go for a meal in Psaraki fish taverna, which comes highly recommended – see the sections on beaches and restaurants in Santorini below. Or you can head back to Akrotiri and eat at “I spilia tou Nikola”. As this is your last day in Santorini, you should make the most of it. Depending on where you are staying, make sure you reach the west side of the island in time for your last Santorini sunset. In fact, if you are staying at a hotel with a sunset view in Santorini, it would be a shame not to spend some time on your balcony, sipping a glass of Vinsanto and enjoying Santorini’s sunset! I’ll be honest about it: if you were thinking to go to Greece mainly for beaches, Santorini really isn’t your best option. There are plenty of islands that have much nicer beaches, fewer crowds and lower prices. However, if you have three days in Santorini, you should still visit a couple of beaches. The west side of the island has very few beaches, which you can only reach by boat. Santorini’s most visited beaches are found at the north, east and south sides of the island. Eight under Oia, is actually not exactly a beach, yet many locals come here for a swim. To get here, you will need to climb down 200 steps. Ammoudi is one of the most picturesque spots in Santorini, and it gets busy with swimmers and tourists, especially at sunset. Just a warning – this place is not suitable for families or inexperienced swimmers, as the water is deep. Located on the north of the island, is a quiet, secluded beach that you can reach on foot from the main road. It will be affected by northern winds, plus it’s got many pebbles rather than sand, so it’s not for everyone. If you are looking to get away from the beach bars and crowds, it’s a good choice. It’s also your best bet in Santorini if you are a naturist. Over on the north-east side of the island, is another beach covered with dark sand, but not as cosmopolitan and busy as the nearby Kamari and Perissa. This beach is on the north-east of Santorini. Although it’s quite close to the “industrial” area of the island, it’s still a good choice as it’s sandy and shallow, and therefore ideal if you have a family. It’s also the only beach in Santorini where you can go kite-surfing. You can get here through Exo Gialos Karteradou. There are plenty of options as far as bars, restaurants and accommodation are concerned, and it’s less quiet than the most famous beaches of Perissa and Perivolos. Kamaris to the north of Perissa, is a long beach, covered in the same dark grey / black sand, with many loungers, bars and restaurants. Water sports and a beach volley net are also available. If you prefer to stay on the beach in Santorini, Kamari is another good choice. It also has an outdoor cinema, voted as one of the best in Europe. These are two long beaches next to each other, on the southeast side of Santorini. They are covered with dark grey / black sand, or rather fine pebble. This can get very hot, so avoid stepping barefoot! Although Perivolos and Perissa are both very popular, they are big enough to accommodate hundreds of people, so you should be able to find a lounger even at high season. There are also water sports if you are feeling active. The area has plenty of small hotels and rooms to rent, and can be a good choice to stay, especially if you have a family. Naturally, there are many bars and restaurants all around the two beaches. If you have more than 3 days in Santorini and you don’t care about a hotel with views over the volcano, you can use Perissa as a base to explore Santorini, and also spend a few days by the beach. Located at the southernmost spot of the island, is surrounded by several rocks and caves. As a result, although there is an area with loungers and umbrellas, parts of the beach are fairly quiet, and you can have some privacy. As you can expect, there are bars and restaurants on the beach. Bonus: there is no mobile phone reception on Vlichada beach. This is best combined with a visit to Ancient Akrotiri. Lovely for a photo-stop, but not exactly great for swimming in my opinion. It’s probably best to get there on a cruise, and swim off the boat. Close to Red Beach, there is the White Beach (Aspri Paralia). This is a much smaller and quieter beach, where many cruise boats make a stop after the Red Beach. If you decide to go there on your own, you can walk from the nearby Kampia beach, a quiet beach to which you can arrive via a dirt road. Bring your own snacks and water. Greek food is famous around the world, yet most first-time visitors only know a few dishes, like the Greek salad, moussaka and souvlaki. It’s worth exploring a few more dishes in Santorini. Apart from the distinctive wines, Santorini has some unique products, like fava beans and small tomatoes. While Santorini is among the most expensive Greek islands, you can still have a meal for a decent price. And while many restaurants will cater to foreign crowds, it is still possible to have authentic Greek food in Santorini. Here is a small selection of the best places to eat in Santorini. You'll need to pick and choose, as you won't be able to squeeze them all into a Santorini itinerary for 3 days! I spilia tou Nikola – “Nikolas Cave” taverna is an old fish taverna in Akrotiri. Apart from the fish, try the ntomatokeftedes (fried tomato balls), and the moussaka, made with the local white aubergines. Ta dichtia – Right on trendy Perivolos beach, the long-standing “Nets” taverna offers great fish and seafood dishes. Try the marinated anchovies, the spicy “bekri meze” and the fish-pie. Roza – A homely taverna in quiet Vourvoulos area, Roza’s menu changes day by day. Try the fried fish, the rabbit and the moussaka. To Psaraki – Not just a fish taverna, Psaraki (little fish) close to Vlichada beach offers some of the best dishes in Santorini. Try the sardines, the tuna, the octopus with capers and olives and the taramosalata. Metaxi Mas – A taverna offering a mix of Santorini and Cretan dishes, Metaxi Mas in Exo Gonia should not be missed. It’s very popular with the locals so you know that it’s not made for tourists. Dimitris – Located in Ammoudi, this small taverna is run by a Greek-Canadian couple. If you want to leave behind the hustle and bustle of Oia, this is a good option. Try any fish, the ntomatokeftedes and the spaghetti with lobster. Great for lunch too. Skala – When you find yourself in Oia, there will be plenty of options. A restaurant with a long history that comes highly recommended, is taverna Skala, with a fantastic view towards the volcano and a menu to match. 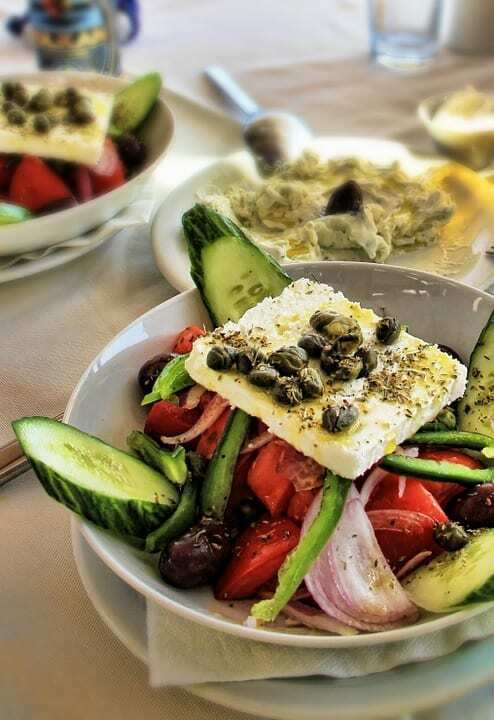 To Krinaki – Located in quiet Finikia, close to Oia, Krinaki (little lily) is a great choice for meat and vegan dishes, and it also offers a good selection of Greek cheeses. It’s a great choice if you want to skip the crowds. Finally, if you want to try fine dining, you can try Koukoumavlos in Fira a restaurant that gets high ratings on a constant basis. Choosing the best Santorini hotel to stay in is no easy task! Although there are plenty of Santorini hotels to choose from, they book up fast especially in the peak month of August. I currently have one dedicated guide to the best sunset hotels in Santorini. For more places to stay in Santorini, take a look at the selection below. If you have a Santorini travel board on pinterest, please pin this Santorini itinerary 3 days travel guide for later! 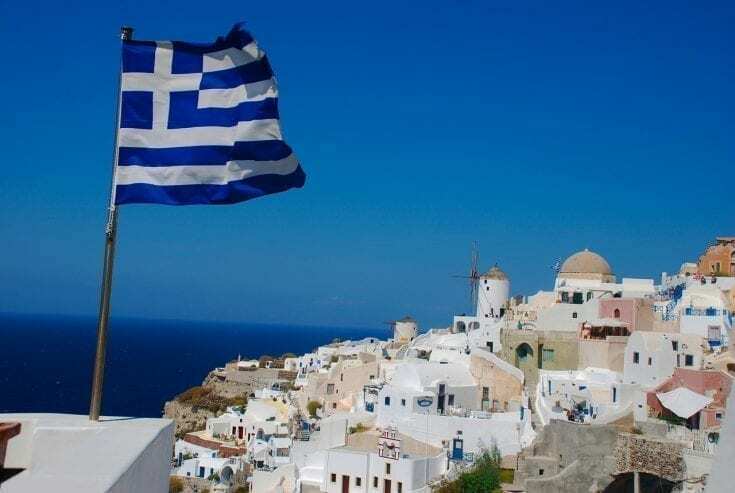 Interested in a Greece travel itinerary that includes Athens – Santorini – Mykonos? Check out my Greece in seven days itinerary. Would you like more information on planning a trip to Santorini? 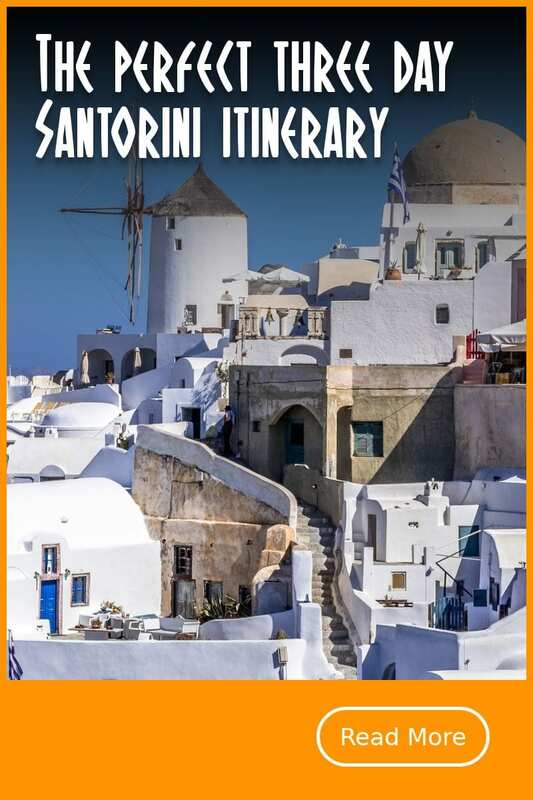 Check out these Santorini travel guides below. Santorini is a popular destination, and so picking the right time to visit is essential. My guide to the best time to visit Santorini on a month by month basis will help you plan when to go. Once you've arrived in Santorini at the airport, you'll need to get to the hotel. This Santorini transfer guide takes you through the options available, including taxi and bus. So, you've arrived in Santorini, but what now? This travel guide takes you through the best things to do in Santorini during your vacation. Most people stay in Santorini for a couple of days, but if you're staying longer, you'll want to think about a day trips or two. This guide to Santorini day trips goes through the most popular, including the Santorini Volcano trip. 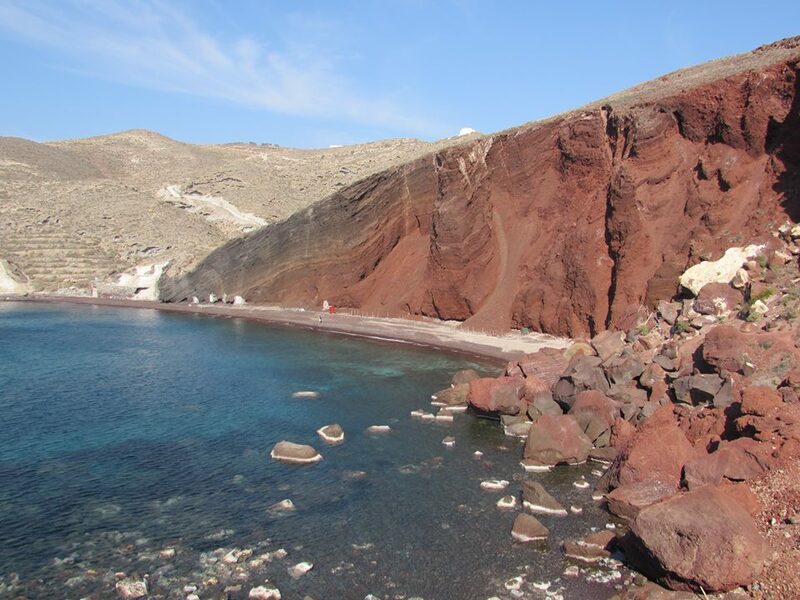 Red Beach is one of the most famous beaches in Santorini. This guide explains all about it, and is essential reading before planning a day on Red Beach Santorini. Santorini is world famous for the spectacular sunsets. You can even see them from a select few hotels! My guide to Santorini sunset hotels will help you choose the best place to stay with a view. The walk from Fira to Oia is highly recommended. You'll walk along the Caldera with breathtaking views all the way. This full guide to the Fira - Oia hike will help you prepare. Note - It's an easy, non-technical walk, but keep in mind it can get hot in Santorini! We will be in Santorini the first week of June. What kind of temperatures should we expect? Will the water be too cold for swimming? Thanks! It’s always difficult to tell with weather. Just yesterday, there was a hail storm in Athens with colder temperatures. The year before we were already hitting the beach! My gut feeling tells me it would be warm enough for most people to swim in Santorini in June.